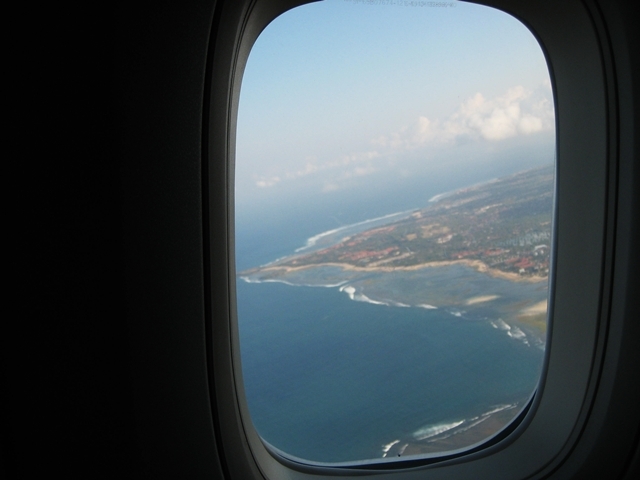 Our Cathay Pacific flight from Bali to Hong Kong was sad–we just didn't want to leave Bali! 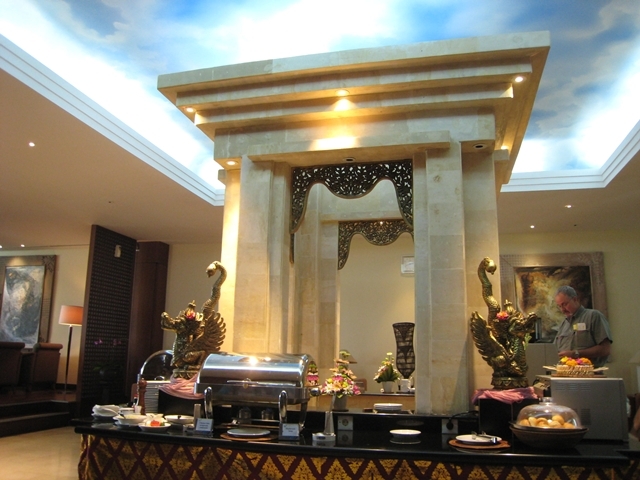 We were very grateful to have the VIP airport assistance provided by Amankila's dedicated staff member at Denpasar airport, who smilingly and deftly wheeled our luggage cart, with the munchkin on top, to the crowded airport entrance, then to check-in. Afterwards, he had us stand in the shortest passport check line while he took the required funds to pay the airport departure tax, returning with the change. Completely seamless, and such a nice perk of staying at the Amankila. At airport check-in, I simply expected to remain in our assigned business class seats on the upper deck, since my attempt to be seated in first class from Hong Kong to Bali went nowhere. 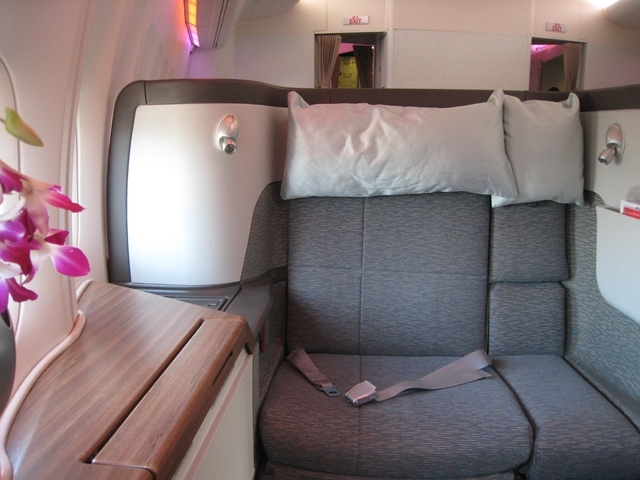 Mind you, Cathay Pacific does not sell the first class seats, and the meal is still business class, but Cathay does upgrade elites and sometimes passengers flying on first class awards, as my husband and the munchkin were. 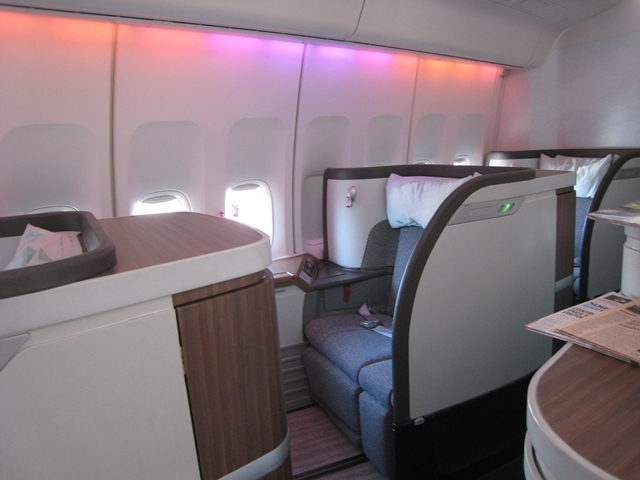 To my pleasant surprise, without my asking, the agent upgraded us to first class seats–even me, to keep us together, though my entire award ticket was in business class–what luck! I wouldn't be surprised if the Amankila agent had more to do with it than my husband's and munchkin's first class award tickets, but I don't know for sure. 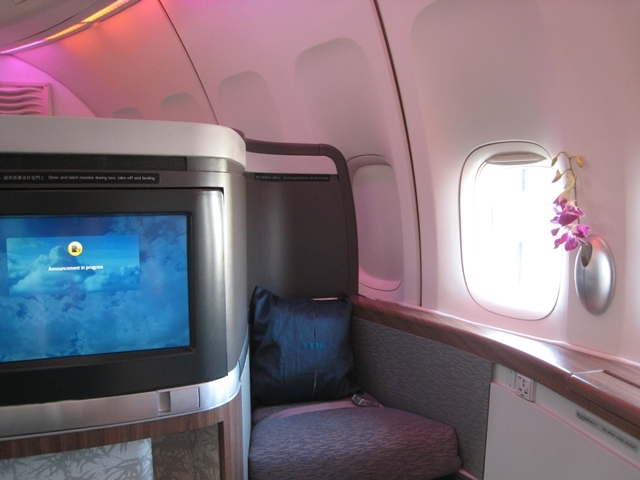 Once our flight was called, it turned out to be quite a hike to get there, but fortunately we made it on time and were pleased to get settled in the six suite first class cabin. In addition to the three of us, there were two other passengers. 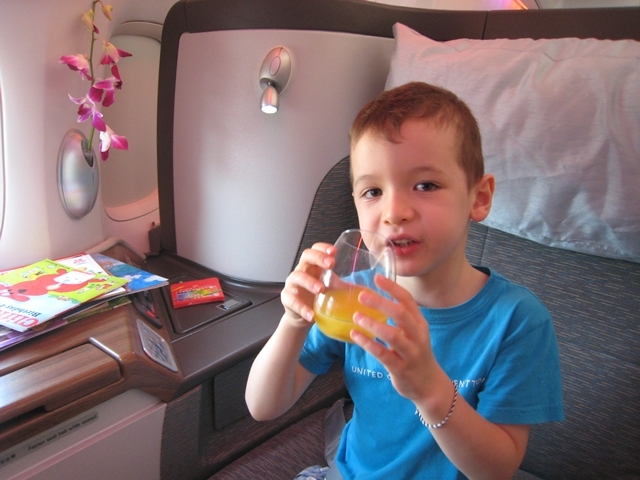 The flight attendants weren't fazed at all by the munchkin, who was seated in 2A, and he happily enjoyed a pre-flight drink of orange juice. Since it's a regional flight, there isn't of course a turndown service or mattress, but it's still comfortable enough, and the passenger across from the munchkin was even lightly snoring not that long into the flight. While I almost never use the in-flight entertainment, the IFE worked perfectly and there were a slew of movies and programs to choose from. The ottoman was roomy enough for me to sit there, across from the munchkin, for dinner service. 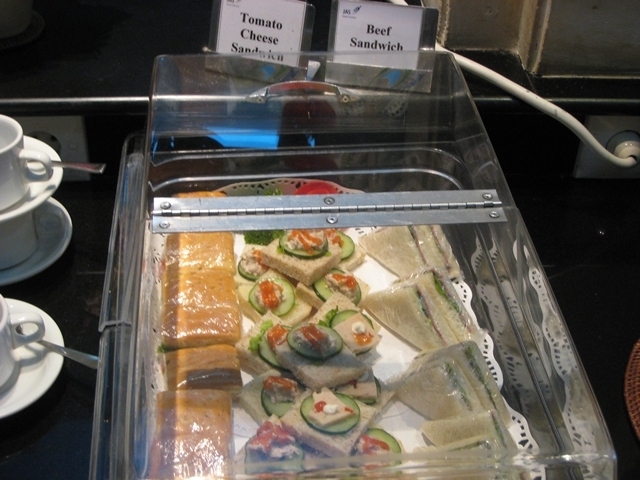 We were still pretty hungry, having only had a few snacks in the Denpasar Lounge to tide us over, and even though it was the same menu as in business class, it looked very good for a regional flight of just 4.5 hours (good luck getting the equivalent in domestic U.S. first class!) Apologies for the blurriness of the photo. It was nice for a change to be able to sit across from the munchkin at dinner. So civilized! 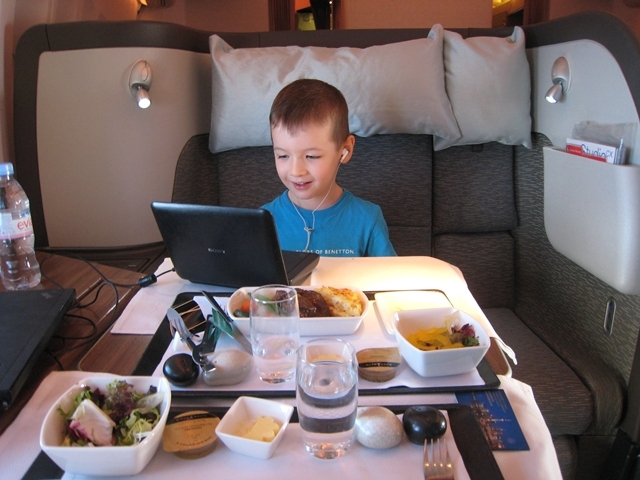 Yes, eventually he was done eating and talking and wanted to watch one of his movies, but he held up pretty well for a 4-year old (and as far as I know from his snoring, our fellow passenger wasn't disturbed at all by having a kid in first class). 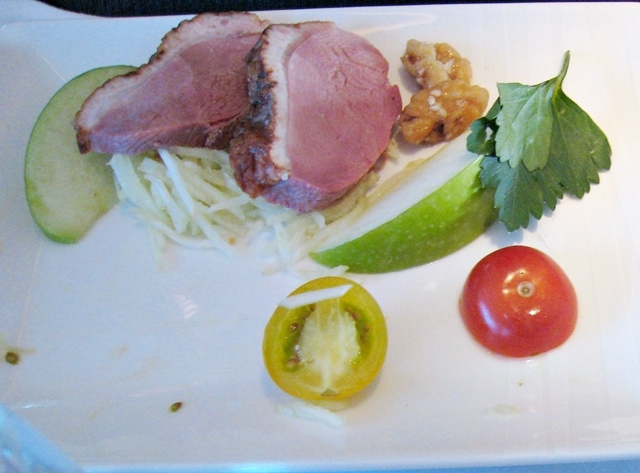 For the entree, I got the braised lamb shank for the munchkin, and although he only ate a little bit (having filled up on duck breast and bread) I tried it and it was very good–I would have been happy to serve it at home for a family dinner. It came with a cheesy potato gratin, also good though rich. I ordered the prawns in tumeric sauce, which was also delicious, and a nice lighter choice. 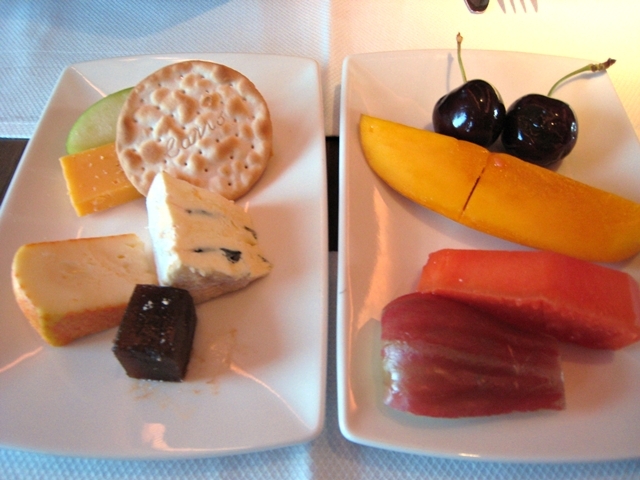 Fruit and cheese plates were similar as what we were offered on the outbound Hong Kong-Bali flight, and a nice selection, especially the fruits, which included cherries and a fruit I couldn't identify. I also enjoy the membrillo (quince paste) they serve with the cheese, although it would be nice to have a more aged cheese to pair with it. 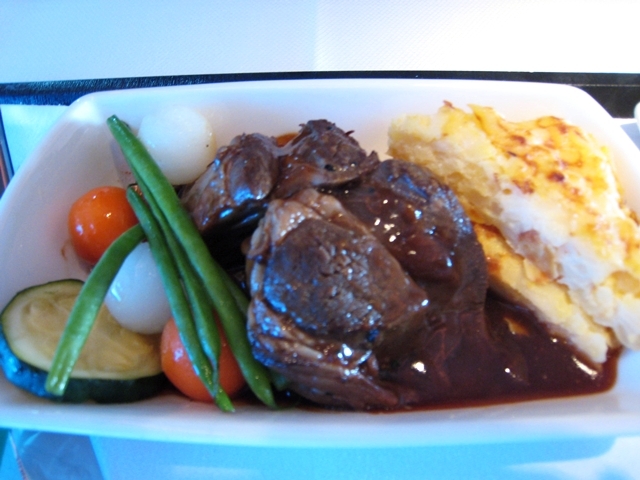 But that's not a complaint, just a suggestion–I was much more impressed with this business class meal than the one I ate on my Cathay Pacific Business Class NYC to Hong Kong flight. 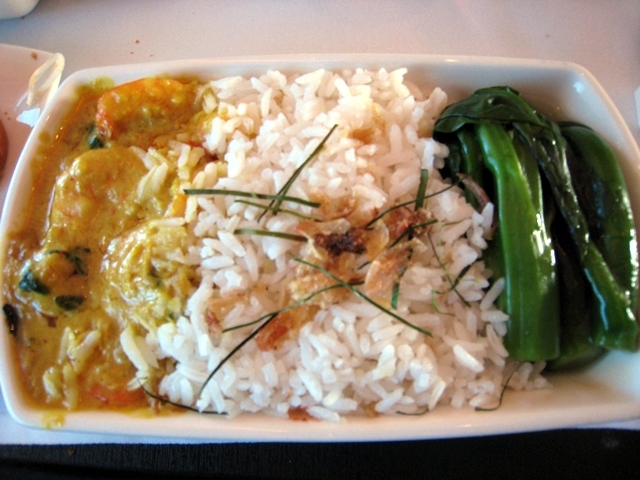 Given the 7 or so meals I've sampled, I still find that Cathay executes Western food better than Chinese food (for anyone who has had really great Chinese food), but the tumeric prawns was at least a semi-Balinese dish, not Chinese, and it was better than most of the Chinese dishes I tried on other flights. 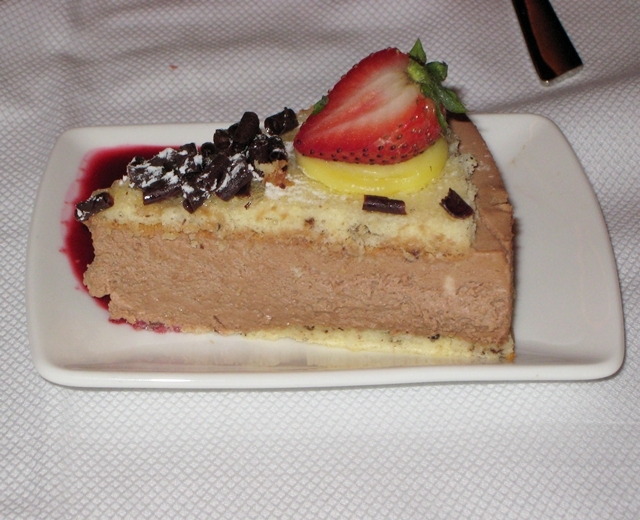 The Chocolate Mascarpone Cream Cake was good–not stellar, but good, and better than the desserts I've had in Swiss Business Class. 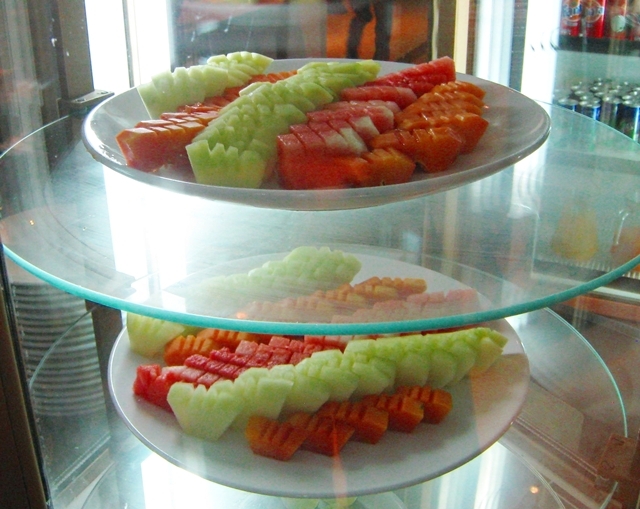 I'm a bit of a dessert fiend, so I can safely say I've never had a truly amazing airline dessert. In fact, one of the better desserts I've had was in Air France economy, a pear frangipane tart, although that was years ago, so who knows what they're serving now. But I digress. 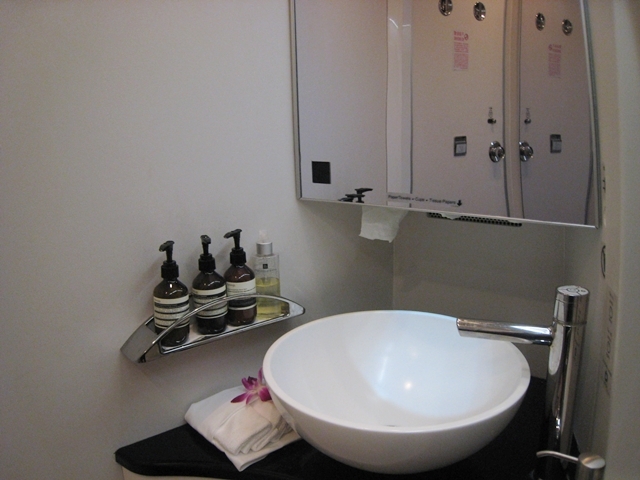 Interestingly, even though first class isn't sold and everyone was served business class meals, the bathrooms were still reserved exclusively for those of us sitting in first class. 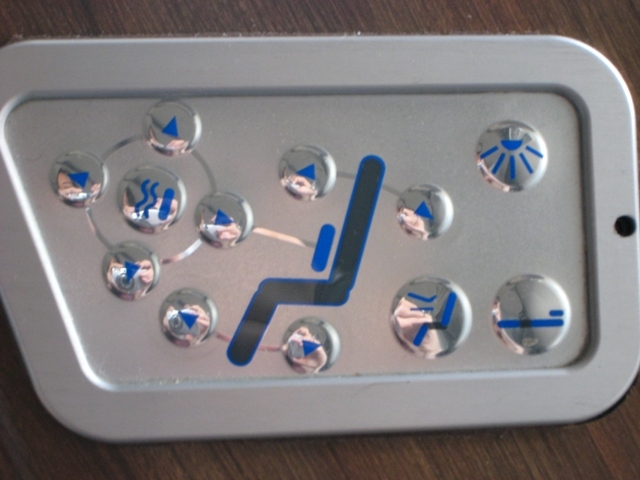 The flight attendants would actually keep the bathrooms locked until someone from first class needed to use one. 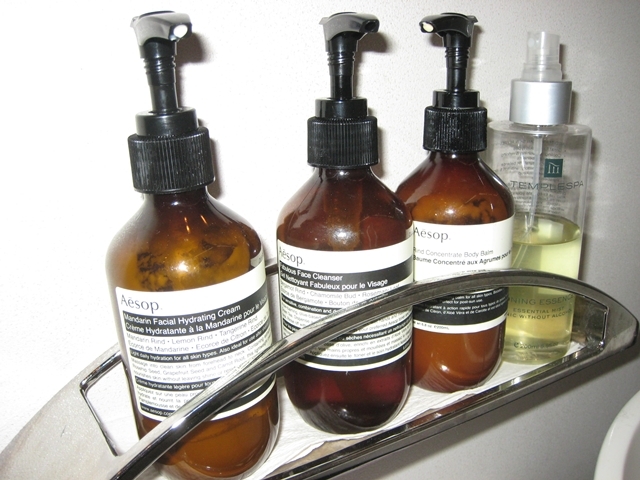 There are Aesops skincare products in the bathroom, a nod to this Austalian favorite of the beauty cognoscenti. The Verdict: For me, a league ahead of the business class product we arrived on Hong Kong to Bali. That's not a put down of the service, which was very good on that flight as well (and incredibly concerned and attentive when a glass shattered near my son and me, which could happen anywhere). 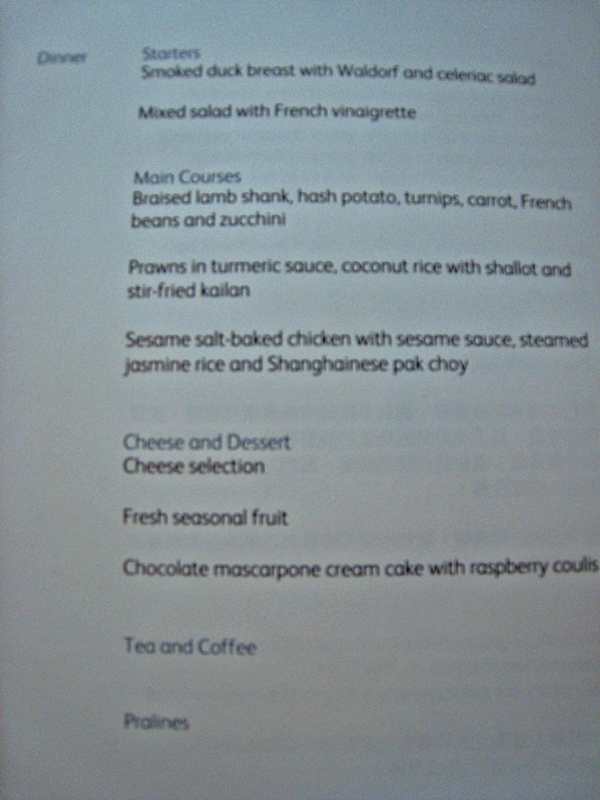 And the meals, as I mentioned, are Business Class because Cathay doesn't sell First Class on this flight. But the luxury of space and being able to sit comfortably together and read to my son, have dinner across from each other, and plenty of space while resting (or in my son's case, sleeping) was fantastic. Unfortunately, unless you're top tier with Cathay Pacific or oneworld, there's no guarantee you'll be able to get this upgrade flying between Bali and Hong Kong or vice versa. But that makes it even more of a treat when you do chance to get it! As a reminder, although we booked this and our other flights last year with pre-devaluation British Airways Avios, the best award value now is using 45,000 American AAdvantage miles one way for this flight, or include it as part of a 67,500 mile one-way from the U.S. to Bali via Hong Kong in First Class (although this flight is in Business Class) if you're not stopping in Hong Kong. Remember that American does not allow international stopovers of more than 24 hours, so if you do want a stopover, you'll need to use additional miles for Hong Kong to Bali.